Did you know you can paint with sound? Did you know that you can create a musical landscape with a playlist? What we do here on 3 Chords & the Truth is paint soundscapes, which is the same thing as a musical landscape, with audio equipment as your canvas and your ears substituting for your eyes. This edition of the podcast takes the concept of soundscapes and -- BAM! -- kicks it up a notch. WHEN YOU look at the playlist for this week's episode of the Big Show, what you see is a spreadsheet. When you listen to the playlist for this week's show, what you hear is magic. What you hear is pieces of music and snippets of sound creating a whole that is greater than the sum of its parts. You hear familiar songs put together in unfamiliar ways. You hear unfamiliar compositions take on a certain familiarity. What you don't hear is something that you fully expect. What you cannot be when faced with a fresh soundscape is complacent. WE HAVE a media world out there that's overrun by complacency. 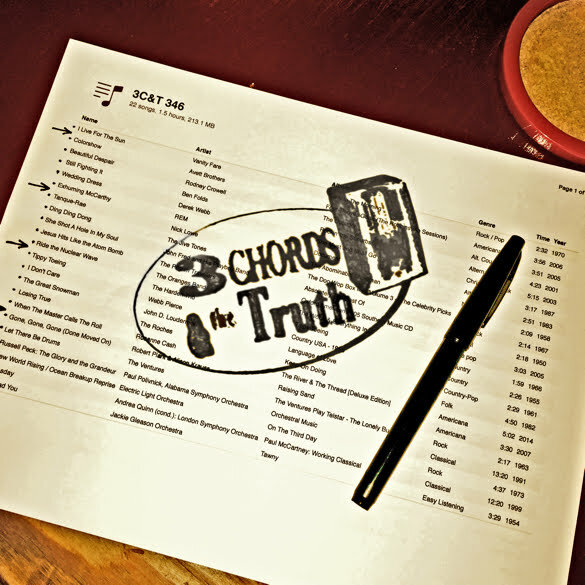 3 Chords & the Truth ain't that. And that's an audio picture worth painting.